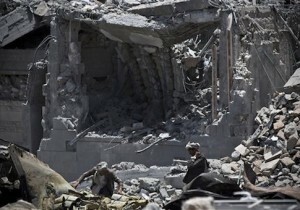 Estimates put the number of both Iranian and Iraqi Shi'ite forces helping the Houthis in Yemen at around 5,000 people. The number of Lebanese Hezbollah members in Yemen is not known. On Sunday, Quds Force Deputy Commander, Brig. Gen. Esmail Ghani was quoted as confirming the fact that the IRGC is training Yemenis. "Each one who is with us comes under the banner of the Islamic Republic and this is our strength," Ghani said, according to Iran's Mashregh News, an outlet run by the IRGC. "The defenders of Yemen have been trained under the banner of the Islamic Republic and the enemies cannot deal with Yemeni fighters." It was the first official reference to Iran's training of the Houthis in Yemen. According to several officials, the ultimate goal of the Iranians in Yemen is to control the Red Sea chokepoint of the Bab-el-Mandeb. "The Iranians’ ultimate target is the strait [Bab-el-Mandeb] and the House of Saud is the other target," one official said. The Bab-el-Mandeb is a strategic chokepoint that could be used by Iran to block oil shipments and U.S. warship movements from the Mediterranean to the Indian Ocean and Persian Gulf. Iran already can threaten the region’s other strategic chokepoint, the Strait of Hormuz in the Persian Gulf. Control over the Bab-el-Mandeb would give Tehran additional regional power to control oil and other passage to and from the region. A CIA spokesman declined to comment on the Iranians in Yemen. State Department spokesmen did not return emails seeking comment. The Obama administration is seeking to conclude a nuclear agreement with Iran by the end of June, and is keeping quiet about the Iranian push to control Yemen. Middle East specialists, however, said the influx of Iranian and Hezbollah fighters is a troubling indicator of a growing Iranian threat to the region. "It would effectively put the Quds force on the Saudi border and potentially give Iran a naval and air presence near the Bab-el-Mandeb, and the exit from the Red Sea to the Indian Ocean—a key trade route for petroleum and all trade and U.S. naval movements through the Suez Canal," said Anthony Cordesman, with the Center for Strategic and International Studies. Cordesman said if the intelligence reports are confirmed, "it is the first real sign that Iran is playing a major role in Yemen." The Iranians appear to be targeting both the Riyadh government and strategic Bab-el-Mandeb strait, he said. Iranian forces in Yemen "could also lead to far more serious tensions between Sunni and Shiite throughout the region," Cordesman said. "A struggle where Iran takes real chances to help Yemen's Houthi and Shi'ite population could deeply divide a country the CIA estimates is 35 percent Shiite and 65 percent Sunni, and increase Sunni and Shiite tensions throughout the entire region," he said. Michael Rubin, with the American Enterprise Institute, said Iran is following the Soviet practice of using proxies to advance regional interests. "There's no excuse for ignorance; this is right out of Iran's playbook," Rubin said. "It's Tehran's equivalent of the Brezhnev Doctrine: Once an Iranian proxy takes territory, Iran will use its full array of power to make sure it keeps it." Rubin said Iran may not have sparked the Yemen crisis, "but no one can accuse Tehran of letting a good sectarian crisis go to waste." Former CIA Middle East specialist Bruce Riedel also said the influx of Iranians would assist the Houthis. "Small numbers of Hezbollah and IRGC advisers have been in Yemen for the last several years," Riedel said. "The Houthis very much admire the Hezbollah organization for its successes in fighting the Israelis and have tried to use Hezbollah as a model for their own development. Together the two are a force multiplier for the Houthis." On Monday, Yemeni forces opposing the Houthis took control of a southern province held by Houthis and forces loyal to former Yemeni President Ali Abdullah Saleh, who was ousted from power in 2012 following mass protests, the London-based Arabic newspaper Alsharq Al-Awsat reported. The re-taking of the southern province capped a months-long offensive by Saudi-backed tribal forces loyal to President Abd Rabbuh Mansur Hadi. The pro-Iran Houthis took control of the Yemeni capital of Sanaa last year and conducted a coup in February. Saudi Arabia has been conducting air strikes against Houthis in Yemen since March 26 as part of Operation Decisive Storm, a Saudi-led aerial bombing campaign. Most of the air raids have been carried out by Saudi warplanes, but United Arab Emirates bomber jets also have taken part. Saudi-backed forces now control Yemen’s airspace and most ports, according to reports from the region. Shahin Gobadi, a spokesman for the Paris-based Iranian opposition group Mojahedin Organization of Iran, said the Quds Force oversees Iranian policy toward Yemen. Quds Force commanders are assisting the Houthis in conducting military operations and have set up communications with the Quds commanders. The Quds Force also has dispatched additional Hezbollah fighters and commanders. "As the war and conflict has intensified, the presence of Iranian forces—non-Arabs and those who do not speak Arabic—has become more difficult in Yemen," Gobadi said. "As such, Tehran has intensified dispatching more forces from Hezbollah to Yemen. Given the current circumstances, they have more room to maneuver and function." Houthi military plans and operation are "completely under the supervision and control of the Quds Force," Gobadi added. IRGC Maj. Gen. Qassem Soleimani, the Quds Force commander, directs several special committees to back the Houthis, according to Gobadi. Some 50 tons of Iranian weapons and other aid was sent from Mehrabad airport in Tehran to Sanaa last march March in four shipments, Gobadi said, noting the shipments were disguised as humanitarian aid from the Iranian Red Crescent. A Gulf intelligence official told the BBC in early May that the intervention against the Houthis by several Gulf states revealed some of Yemen’s estimated 300 Scud short-range missiles under Houthi control had been moved to locations near the Saudi border. As a result, Saudi and Gulf Arab allies took action to oppose what they viewed as an Iranian threat to the peninsula.